Ahura Mazda (Modern Persian: اهورا مزدا (/əˌhʊrəˌmæzdə/;) (also known as Ohrmazd, Ahuramazda, Hourmazd, Hormazd, Harzoo and Hurmuz, Lord or simply as spirit) is the Avestan name for the creator and sole God of Zoroastrianism, the old Mede and Persian religion which spread across Asia predating Christianity. Ahura Mazda is described as the highest spirit of worship in Zoroastrianism, along with being the first and most frequently invoked spirit in the Yasna. The literal meaning of the word Ahura is "mighty" or "lord" and Mazda is wisdom. 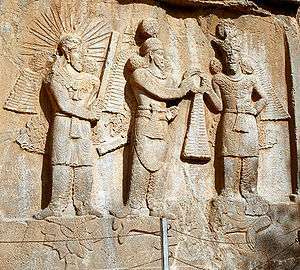 Ahura Mazda first appeared in the Achaemenid period (c. 550 – 330 BCE) under Darius I's Behistun Inscription. Until Artaxerxes II (405–04 to 359–58 BCE), Ahura Mazda was worshipped and invoked alone. With Artaxerxes II, Ahura Mazda was invoked in a triad, with Mithra and Apam Napat. 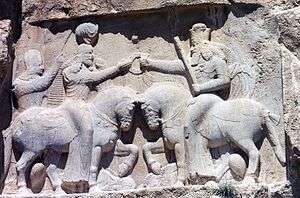 In the Achaemenid period, there are no representations of Ahura Mazda other than the custom for every emperor to have an empty chariot drawn by white horses, to invite Ahura Mazda to accompany the Persian army on battles. 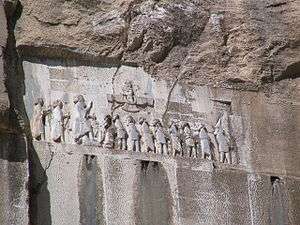 Images of Ahura Mazda began in the Parthian period, but were stopped and replaced with stone carved figures in the Sassanid period. "Mazda", or rather the Avestan stem-form Mazdā-, nominative Mazdå, reflects Proto-Iranian *Mazdāh (female). It is generally taken to be the proper name of the spirit, and like its Sanskrit cognate medhās, means "intelligence" or "wisdom". Both the Avestan and Sanskrit words reflect Proto-Indo-Iranian *mazdhā-, from Proto-Indo-European *mn̩sdʰeh1, literally meaning "placing (*dʰeh1) one's mind (*mn̩-s)", hence "wise". Even though Ahura Mazda was a spirit in the Old Iranian religion, he had not yet been given the title of "uncreated spirit". This title was given by Zoroaster, who proclaimed Ahura Mazda as the uncreated spirit, wholly wise, benevolent and good, as well as the creator and upholder of Asha ("truth"). As Ahura Mazda is described as the creator and upholder of Asha, he is a supporter and guardian of justice, and the friend of the just man. At the age of 30, Zoroaster received a revelation: while fetching water at dawn for a sacred ritual, he saw the shining figure of the yazata, Vohu Manah, who led Zoroaster to the presence of Ahura Mazda, where he was taught the cardinal principles of the "Good Religion" later known as Zoroastrianism. As a result of this vision, Zoroaster felt that he was chosen to spread and preach the religion. He stated that this source of all goodness was the only Ahura worthy of the highest worship. He further stated that Ahura Mazda created spirits known as yazatas to aid him, who also merited devotion. Zoroaster proclaimed that all of the Iranian daevas were bad spirits and deserved no worship. These "bad" spirits were created by Angra Mainyu, the hostile and evil spirit. The existence of Angra Mainyu was the source of all sin and misery in the universe. Zoroaster claimed that Ahura Mazda was not an omnipotent God, but used the aid of humans in the cosmic struggle against Angra Mainyu. Nonetheless, Ahura Mazda is Angra Mainyu's superior, not his equal. Angra Mainyu and his daevas (spirits) which attempt to attract humans away from the path of righteousness (asha) would eventually be destroyed. Ahora Mazda was the name of a late 1960s, early 1970s psychedelic and fusion prog-rock band from the Netherlands. ↑ For an explanation of the approximation of mainyu as "spirit", see Angra Mainyu. ↑ Most prominent of these voices was that of the Scottish Presbyterian minister Dr. John Wilson, whose church was next door to the M. F. Cama Athornan Institute, the premier school for Zoroastrian priests. That the opinions of the Zoroastrian priesthood is barely represented in the debates that ensued was to some extent due to the fact that the priesthood spoke Gujarati and not English, but also because they were (at the time) poorly equipped to debate with a classically trained theologian on his footing. Wilson had even taught himself Avestan. ↑ "Ahura Mazda | Definition of Ahura Mazda by Merriam-Webster". Merriam-webster.com. Retrieved 2016-01-11. 1 2 Boyce 1983, p. 685. ↑ Boyce 1985, p. 685. ↑ Boyce 1975, p. 14. ↑ Nigosian 1993, p. 12. ↑ Andrea 2000, p. 86. ↑ Bromiley 1995, p. 126. 1 2 3 4 Boyce 1983, p. 686. ↑ Corduan 1998, p. 123. ↑ King 2005, p. 314. ↑ Whitrow 2003, p. 8. ↑ Maneck 1997, pp. 182ff. ↑ Unknown 1999, p. 429. ↑ Frye 1996, p. 247. ↑ Sims-Williams 1992, p. 44.